Since my summer has been full of writing and conferences and decidedly empty of time spent working with reptiles and amphibians, I decided to take advantage of a recent family wedding (congrats Tanya!) 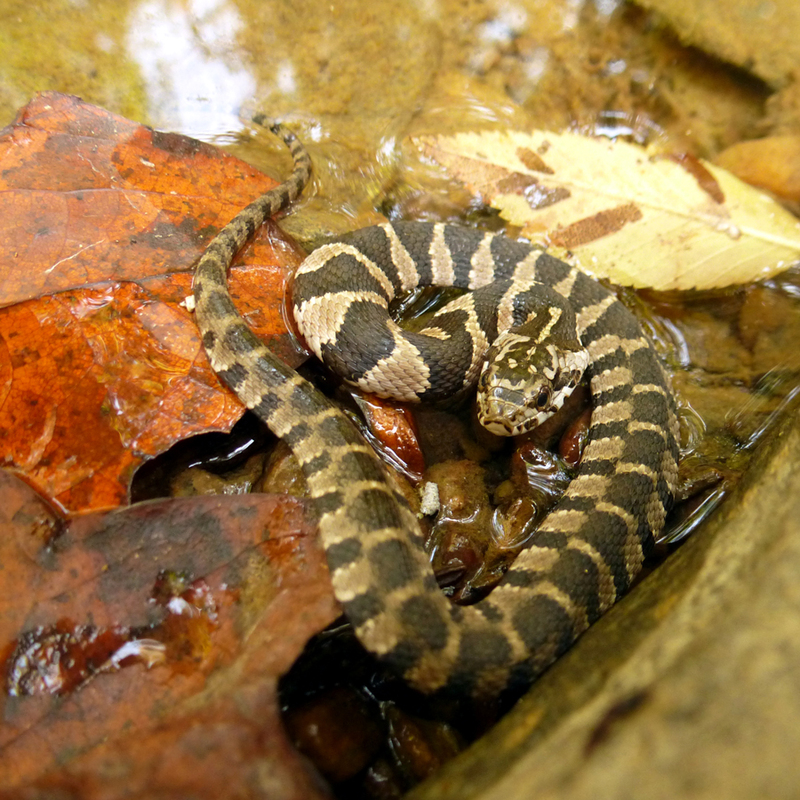 and do some herping in North Carolina, a state I haven’t spent much time in since my undergraduate days in the Herpetology Lab at Davidson College. 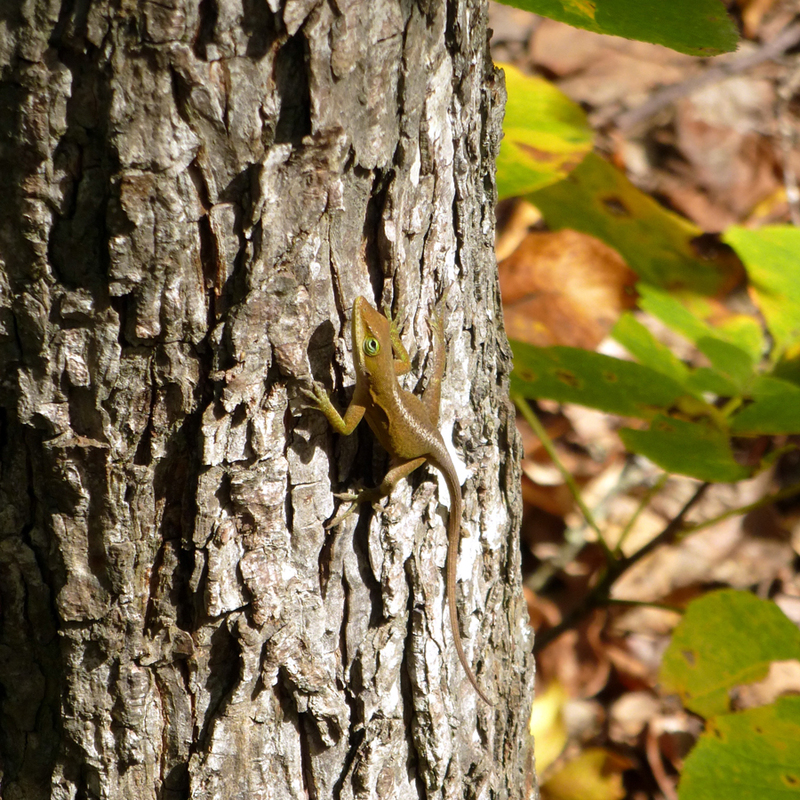 Even before arrival at my final destination, I spotted a promising sign: a green anole (Anolis carolinensis) out basking in the afternoon sun near the Forest Service office. 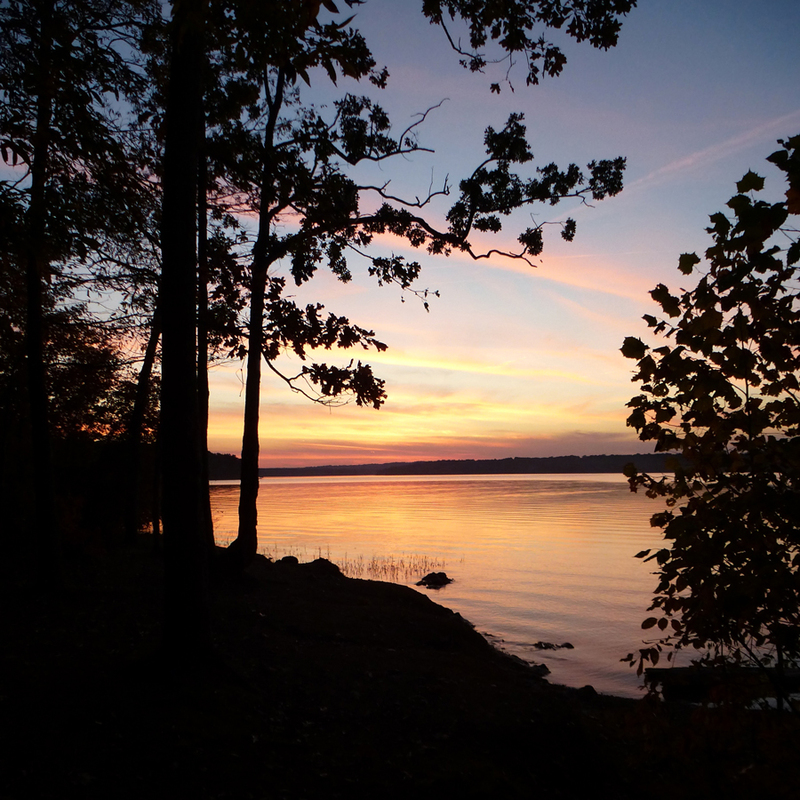 I camped in the Uwharrie National Forest, a relatively small national forest with some nice campsites on Badin Lake. While it’s been getting chilly here in State College, the climate in NC is still rather balmy with daytime temperatures in the 70’s and nighttime temps warm enough for a little reptile activity, at least on the roads. Unfortunately, warm roads with cars and cool weather are a pretty good recipe for snake deaths, and the first snake of the trip was a DOR (dead-on-road) scarlet kingsnake (Lampropeltis elapsoides). 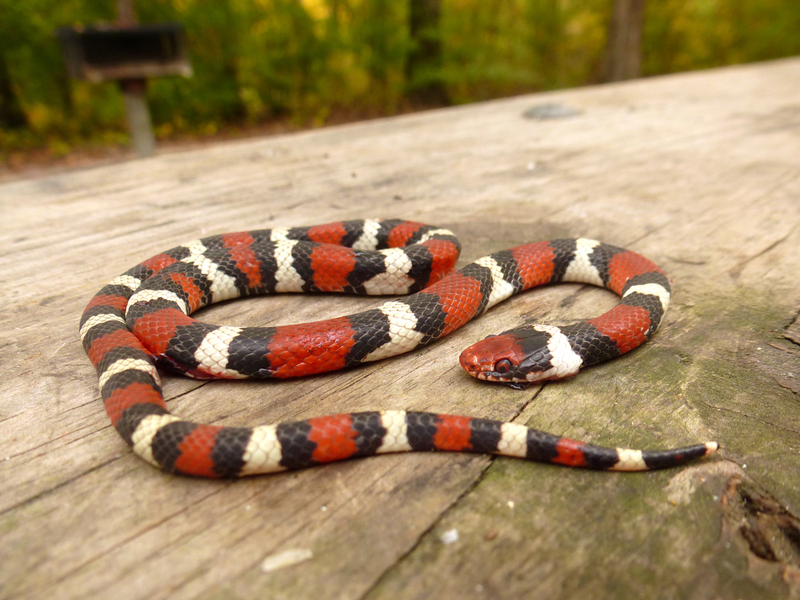 These gorgeous snakes are coral snake mimics and can be an unusual find. 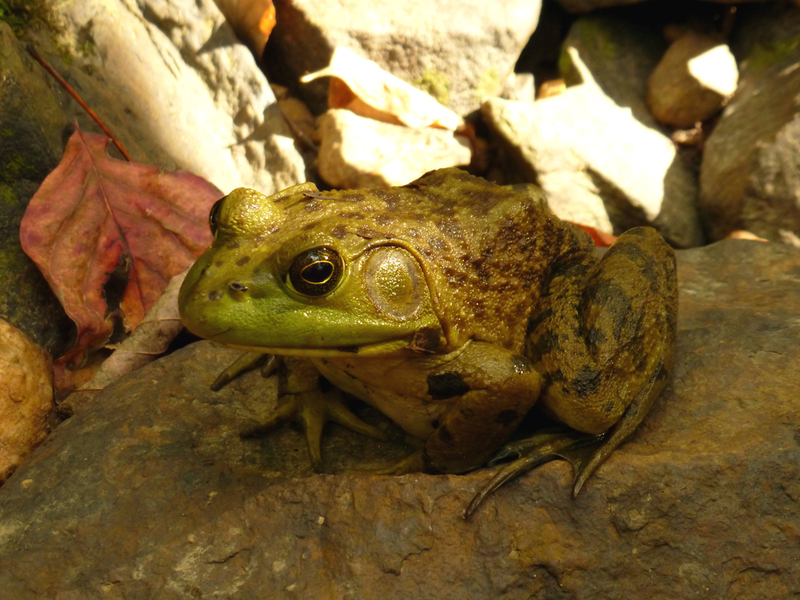 Bullfrogs (Lithobates catesbeiana) were common along the shoreline of the lake and in adjacent streams. 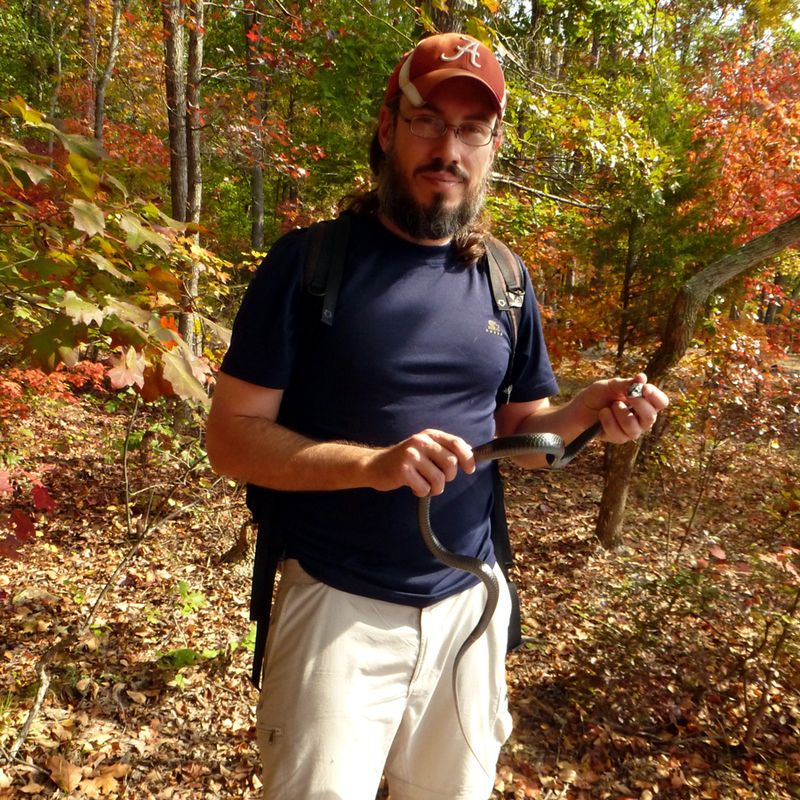 The most surprising thing about finding this black racer (Coluber constrictor) was that it didn’t bite me….what?!? 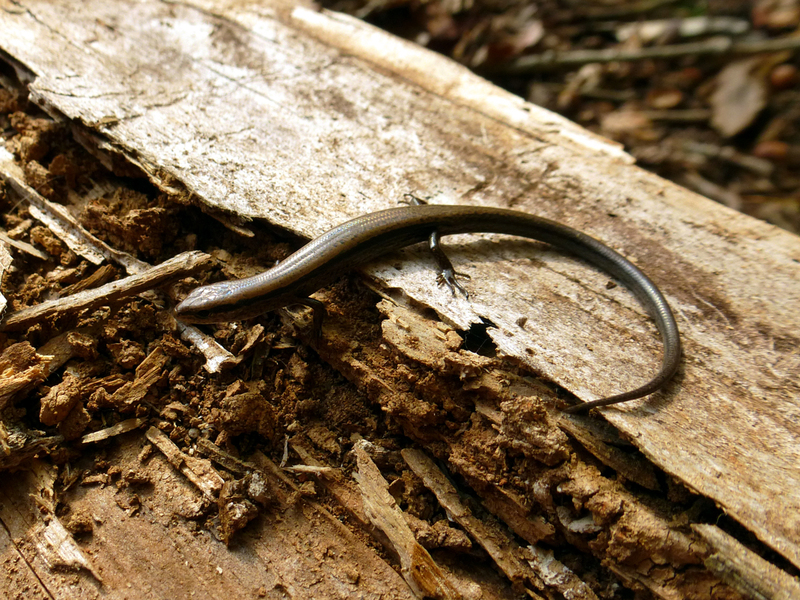 This little brown skink (Scincella lateralis), was moseying through the leaf litter in a sunny patch along the lakeshore. And yes, that is its “official” common name. Scientists are so creative! 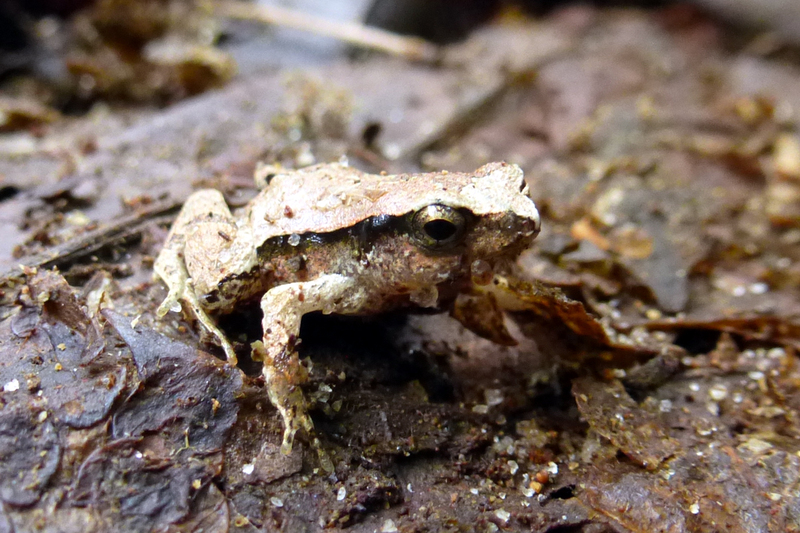 Northern cricket frogs (Acris crepitans) were abundant throughout the forest and easy to spot as they used their outrageously long jumps (> 3 ft for a frog <2 in!) to escape approaching humans (me). 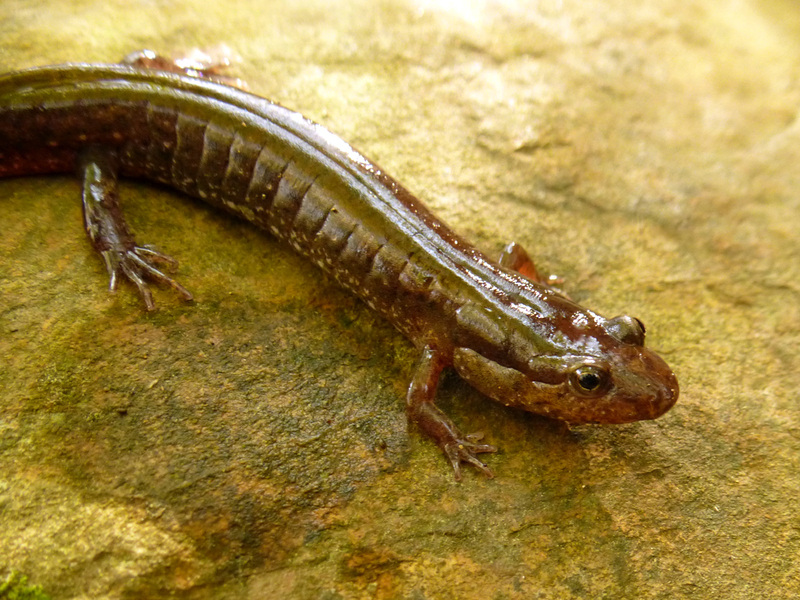 Northern dusky salamanders (Desmognathus fuscus) were holding out in a small spring seep in an area surrounded by muddy creeks and lots of horse poop. 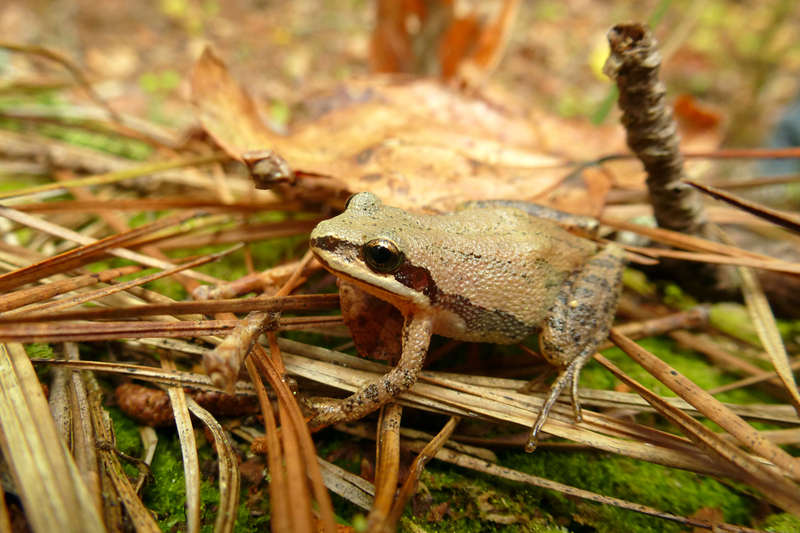 Upland chorus frogs (Pseudacris feriarum) were active, but not chorusing, on a cloudy day. This hatchling midland water snake (Nerodia sipedon pleuralis) was none to pleased to be removed from its natal creek (and bit me numerous times, as watersnakes are wont to do). However, it calmed down (a bit) when return to its aquatic environs. On the way back to PA, I couldn’t resist targeting one specific species, the Peaks of Otter salamander (Plethodon hubrichti). 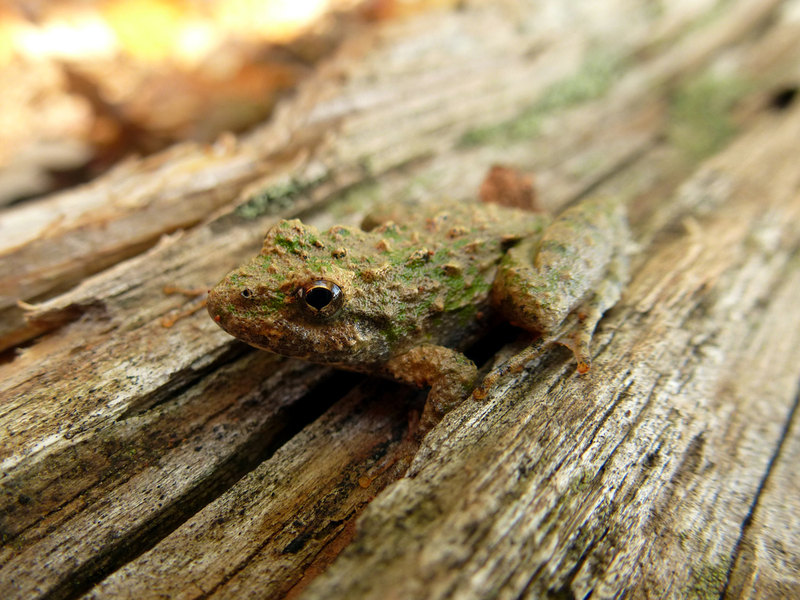 This species is found only along a 13 mile stretch of the Blue Ridge Parkway near Peaks of Otter (surprise!) in southern Virginia and is under review to be considered federally threatened or endangered due to its very limited range. 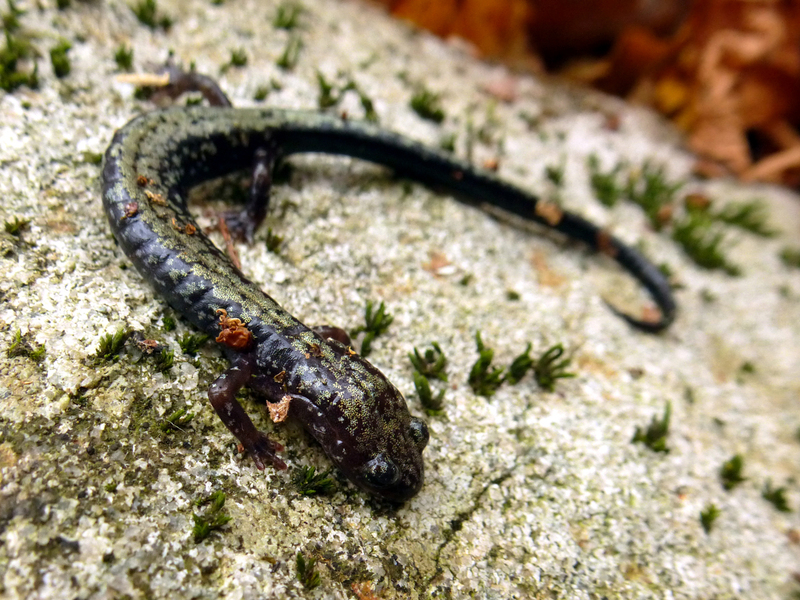 This salamander is named after the eminent citizen naturalist Leslie Hubricht (who also discovered the Red Hills salamander) and was so named after a bit of scientific skullduggery (you can read the story here). 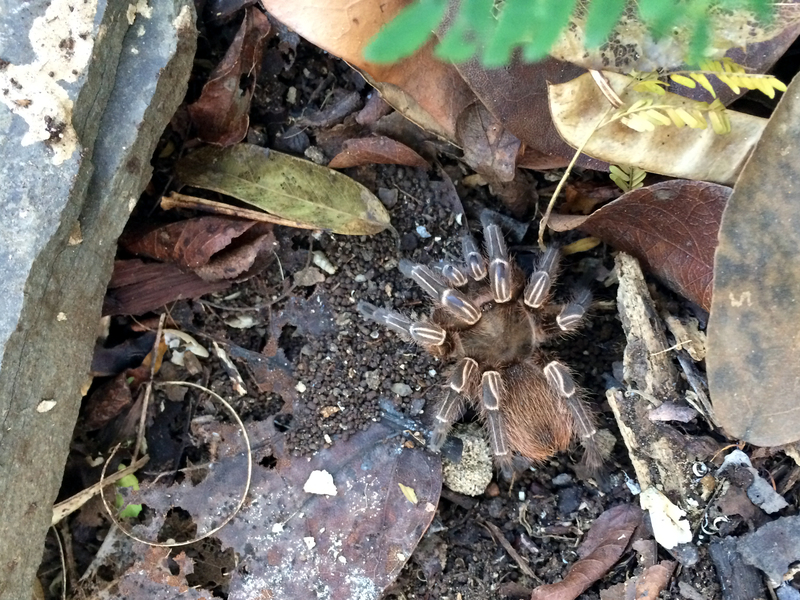 Finding this species was no problem thanks to a tip on a great locality from ex-Langkilde Lab member Sean Graham. I’d found a few, snapped a couple of pics, and was on my way home in under 15 minutes. These ‘manders were all dirty from their stay under the local rocks, but, as I didn’t want to disturb the population too much, I settled for some slightly less polished photos. 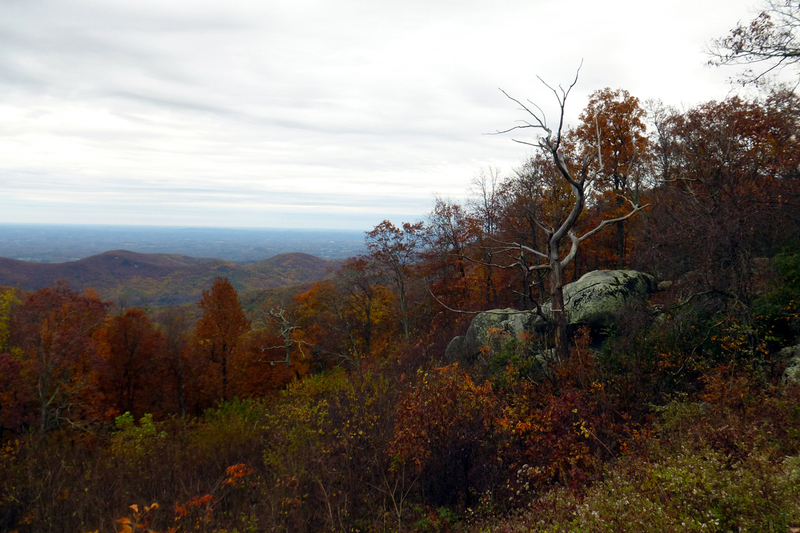 And of course, I couldn’t resist stopping at some of the awesome overlooks scattered along the Parkway. And with that, I’ll enter a long, dark winter of writing and working towards finishing my dissertation! Categories: Fun in the Field | Tags: anole, Frog, herping, herps, Lizard, national forest, salamander, Snake, toad | Permalink. 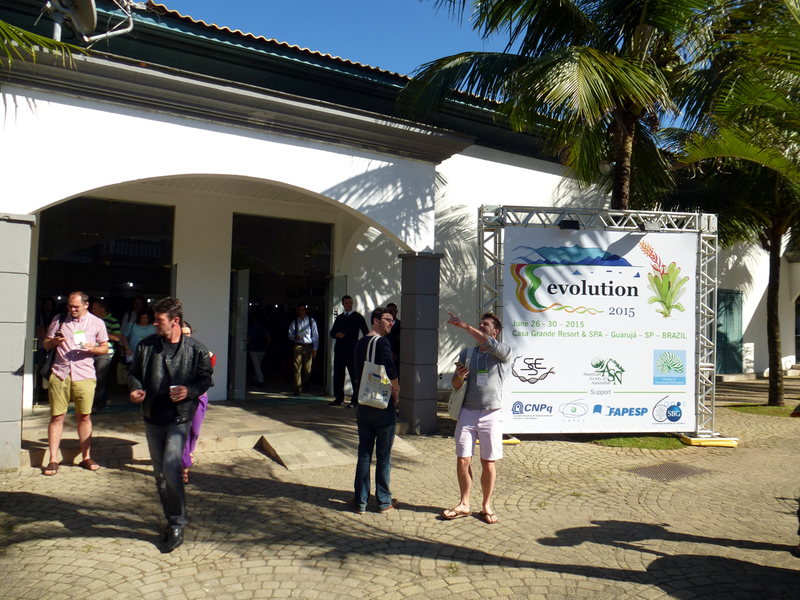 During the past two weeks, I had the great opportunity to travel to Guarujá, Brazil for the Evolution 2015 meeting, a joint meeting of the Society of Systematic Biologists (SSB), American Society of Naturalists (ASN), and the Society for the Study of Evolution (SSE). The trip down was super easy thanks to a not-very-full flight from Detroit straight to São Paolo (meaning only one layover! ), and a conference shuttle from there to Guarujá. 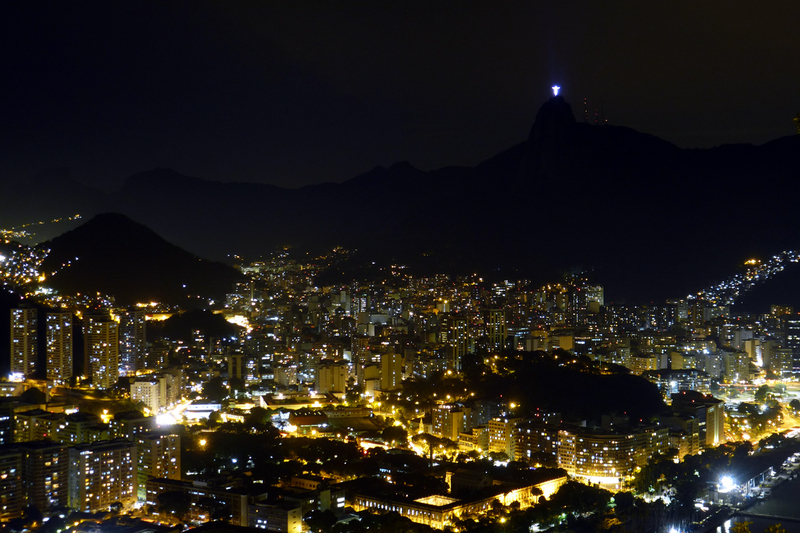 While Guarujá is a beach town on the southern Atlantic coast, it is currently the Brazilian winter, meaning that high temperatures on most days were only about 80 (the horror! ), and nights were breezy and cool. I actually didn’t get in the water at all (so busy with the conference! ), but the beach itself was lovely and full of quiosques (kiosks) selling snacks, sodas, and beers. Sign outside the exhibition hall welcoming participants to Evolution 2015. The conference consisted of days of talks followed by a social mixer, a special presidential lecture for each of the societies, and then a poster session, meaning there were activities from 8:30 am to 9:00 pm each day, with a break for lunch and two coffee breaks (the amount of coffee consumed was truly incredible….I did my own share). Fortunately the conference provided lots of snacks and finger foods that many folks (including me) made meals of, allowing us to avoid the pesky timesink of actually going to dinners. What adaptiveness! 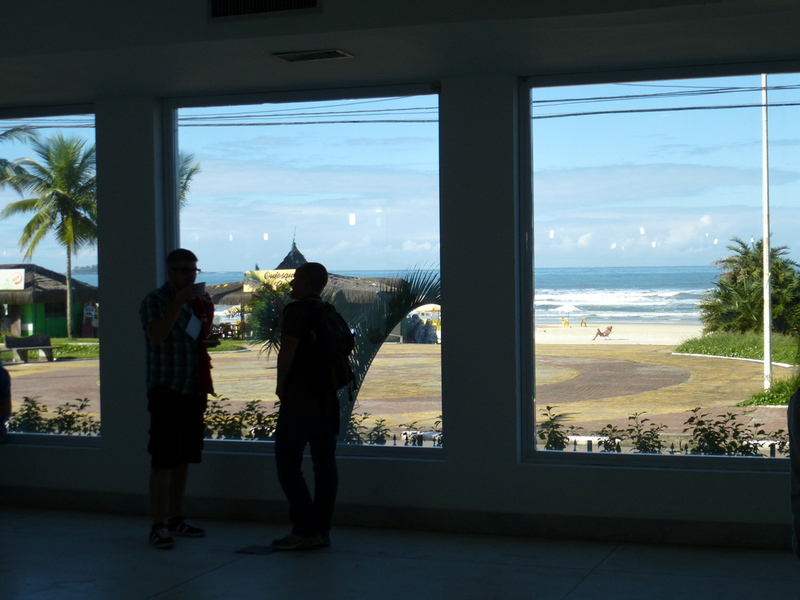 In the exhibition hall, researchers could view posters or the beach, which was just outside! Talks were organized into sessions of 6 or 12 presentations focused on a common theme (e.g. Speciation, Hybridization, Adaptation…), and talks were 12 minutes long, followed by three minutes for questions from the audience (though of course many presenters talked too long and had no time for questions…boooooooooooo). The conference featured six to seven concurrent sessions, so there were plenty of options for finding interesting science to learn about. 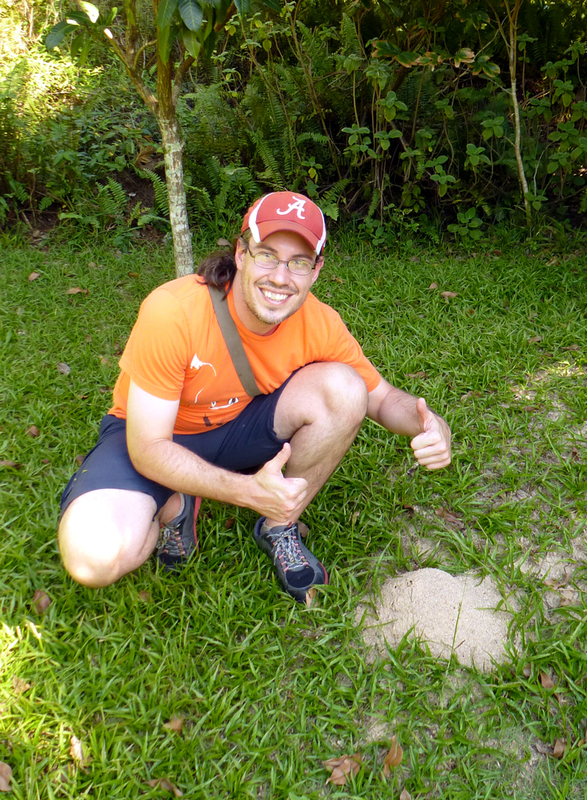 In addition to interesting science, there were also fire ants (Solenopsis) at the conference (though a different species than we have here in the US). I gave my talk as a Hamilton Award Finalist. The Hamilton Award is sponsored by the SSE and given to the student presenting an outstanding talk at the meeting. It was an honor to be in the group of students presenting these talks (it was probably the best session I attended), and being a finalist also came with financial support from SSE (thanks to them!) which allowed me to attend the meeting in the first place. My talk, “An invasive predator, the red imported fire ant, alters latitudinal gradients of multiple traits in a native lizard” focused on how fire ants are altering latitudinal gradients in fence lizard traits, including behavior, stress responsiveness, and morphology. While previous lab research has shown that fire ant invasion affects the values of these traits, this new research extends our knowledge of these traits to the whole range of fence lizards and allows us to show that the changes we’re seeing due to fire ants are the opposite of the trends we see in areas without fire ants. This implies that fire ants can cause very strong changes in fence lizards (and maybe other species) over large areas and short times. More on this when we actually write it up for publication! 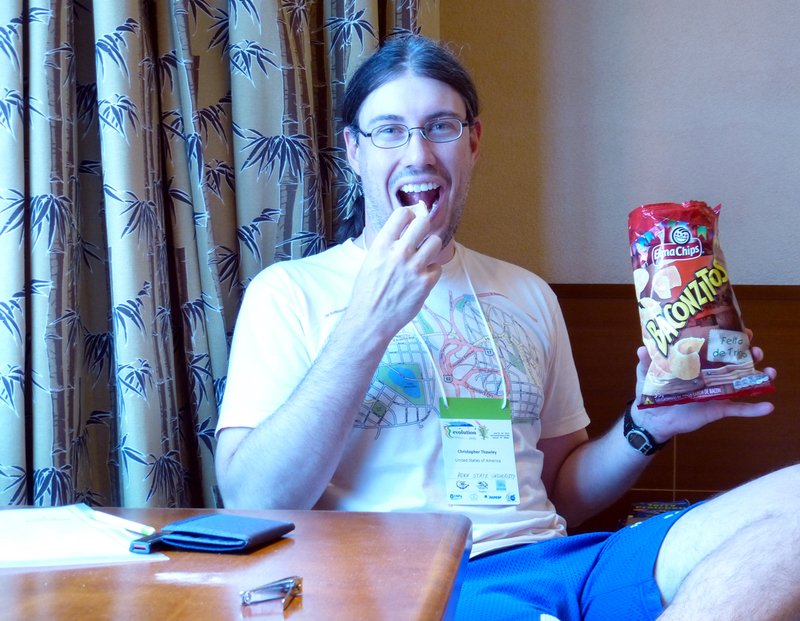 Celebrating finishing my talk the classy way: with a whole bag of Baconzitos! In addition to giving my own talk, I also saw lots of sweet presentations at the conference. One of my favorites was entitled “Moth tails divert bat attack: Evolution of acoustic deflection” by Akito Kawahara, curator at the Florida Museum of Natural History. Akito covered the different ways in which moths can defend themselves from one of their primary predators, insectivorous bats, including acoustic aposematism, by which moths use sound to signal their unpalatability to bats, and acoustic jamming, where moths produce sounds that disrupt the echolocation abilities of bats. Akito’s research looked into why some moths, such as luna moths, have long, spiraling tails. Along with his collaborators, he found that the twirling tails scatter the echolocation signals produced by bats, convincing them that the tails are the largest target on the moth’s body. 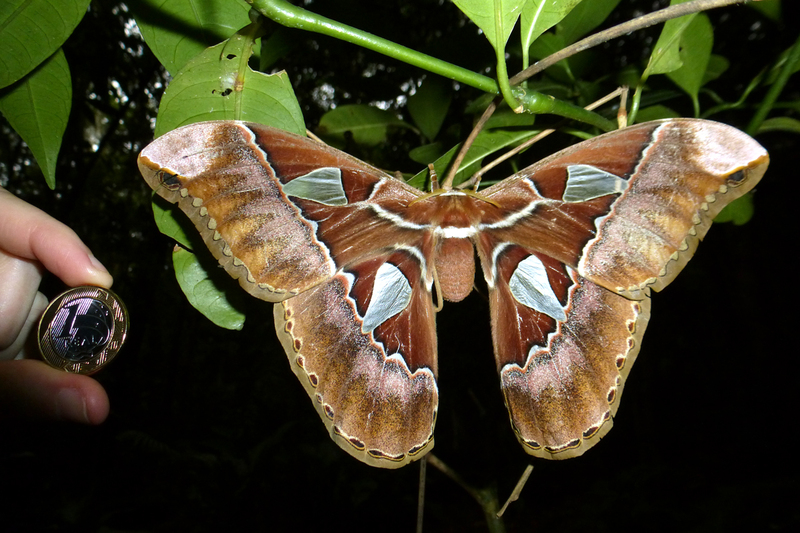 The bats often attack the tails, allowing the moth to escape with the cost of losing a tail…this can essentially give the moth two “extra lives.” For more info, check out this longer write-up (with cool videos!) from Ed Yong or read the published article. By the last day of the conference, many attendees were pretty burnt out due to the near-constant inpouring of high-quality scientific information into our brains, so my roommate Peter and I decided to sneak away for the later half of the day and look for herps. We asked the incredibly helpful Carlos (one of our awesome hotel’s desk managers) if he knew where we might see some lizards or frogs, and he recommended a trail near his house on the southern edge of town. We hopped a taxi to a really beautiful beach, climbed across an aqueduct, and hiked a narrow trail over a mini-mountain right on the coast. 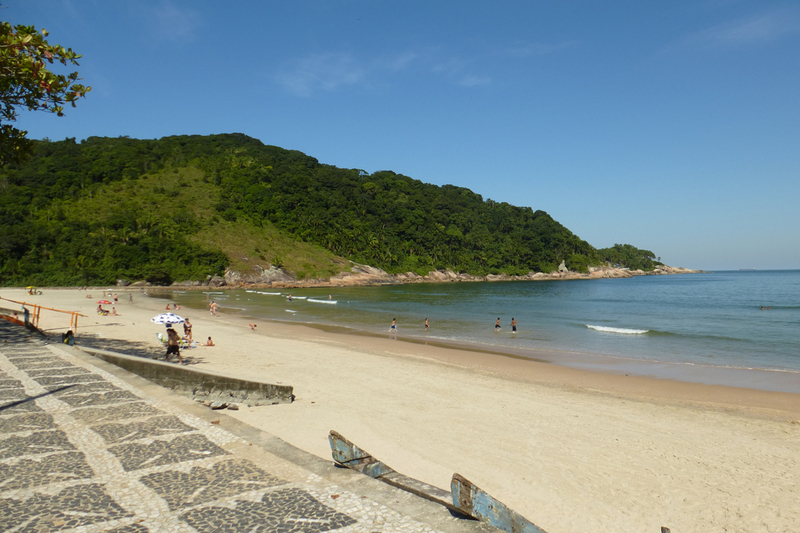 The Praia do Guiauba in the south of town, along with the “mountain” we hiked over. Very nice! We were rewarded with a steep descent down a slippery mountain streambed onto a rocky cove with awesome views out to a local island. Just a quick hike through some coastal forest. On the return journey, we explored further up the stream and looked for frogs, finding two different species (of which we only got pictures of one….someone, I won’t say who, dropped the only specimen of the other before we could get pictures…). 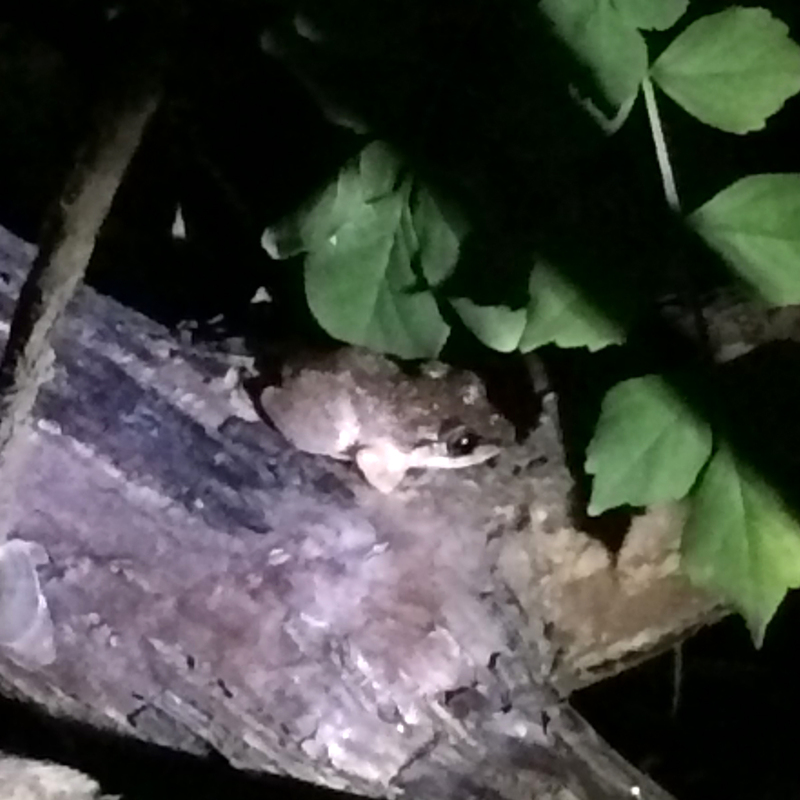 The one frog that did stay with us long enough for a picture is probably in the genus Physalaemus, and might be P. moreirae, an endemic to the area. I also accidentally stuck a rusty pipe into my elbow and had to get Peter to remove some pieces from my flesh once we returned to the hotel, but, since I’m up to date on my tetanus shots, the drama stops there. 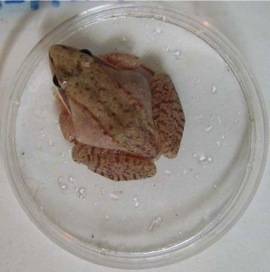 Physalaemus are often called “dwarf frogs”, and as this guy was <1 inch, it’s not hard to see why! After talking a security guard into calling a cab for us so we could actually return to the conference, we had a huge dinner of grilled fish and steak at a beachside restaurant before attending the final evening’s Super Social. Yes, it was actually listed in the program that way, and it did turn out to be quite super. Awards were announced, including those for the Hamilton Award (Alas, I did not win, despite making the most people laugh during my presentation… unfortunately that wasn’t one of the criteria on the grading rubric!). The social continued with an epic 4-hrs-with-no-breaks performance by a Brazilian cover band, featuring backup dancers, choreographed line dances, and costume changes. They ran through sets including Queen covers, classic rock, contemporary club, country, Brazilian hits, and disco. While I was dancing down in front with my friends, I felt a hand on my shoulder and turned around to find the lead singer pulling me onto the stage to do one of the choreographed dances. There was nothing else for it except to kill it onstage as a Brazilian rockstar, so I laid down my best moves to represent for the American contingent at the conference. To the best of my knowledge (and quite fortunately) no video or photographic evidence exists of this, so I’ll give you a pic I stole from a friend’s Facebook of the “country” music portion of the show. After the conference, I took a few days to travel around Brazil on my own. I visited Ilhabela, an island to the north of Guarujá that is 85% preserved as a park of the Mata Atlântica, the threatened Atlantic Forest biome. 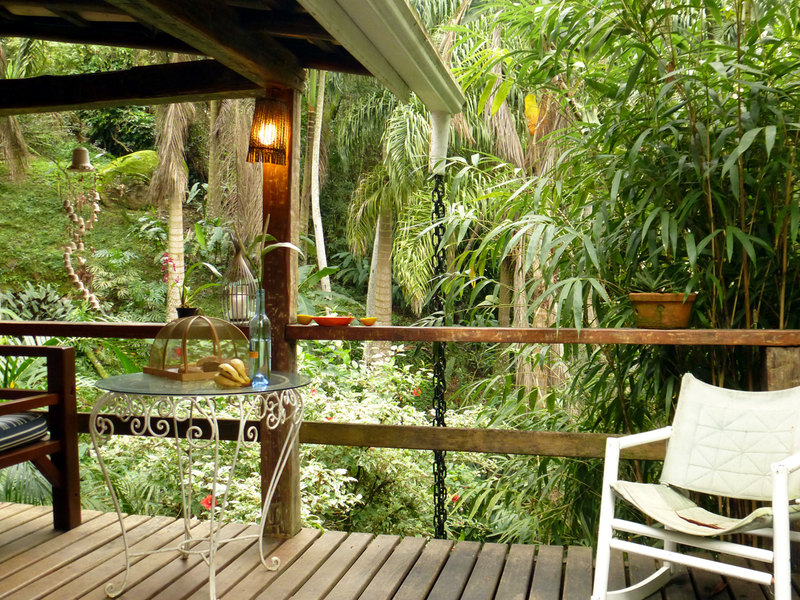 I stayed at a beautiful suite in a jungleiferous location, which independently hosted several other travelers from the Evolution conference. Breakfast was on this porch, and the view was delicious! While it was a bit chilly for herps, there were lots of beautiful endotherms (birds) present. I also hopped on a diesel Land Rover for a 2 hr. jaunt along the one rutted, mountain road that leads across the island. On the other side I explored an awesome waterfall, Cachoeira do Gato, and mucked around in the rainforest looking for critters. The Cachoeira do Gato adding more mist to an already cloudy day in the rain forest. An unidentified frog I found in one of the streams near the waterfall. He was cold and not interested in fleeing. Perhaps some lessons from the fence lizards are in order. I also hiked on the beautiful Praia dos Castelhanos (even though it was a cloudy day) and got eaten alive by the local borrachudos, a biting fly that left bloody streaks on my ankles…awesome! Praia do Gato, just downstream from the waterfall. What you can’t see are the bloodletting insects swarming me while taking this panorama. 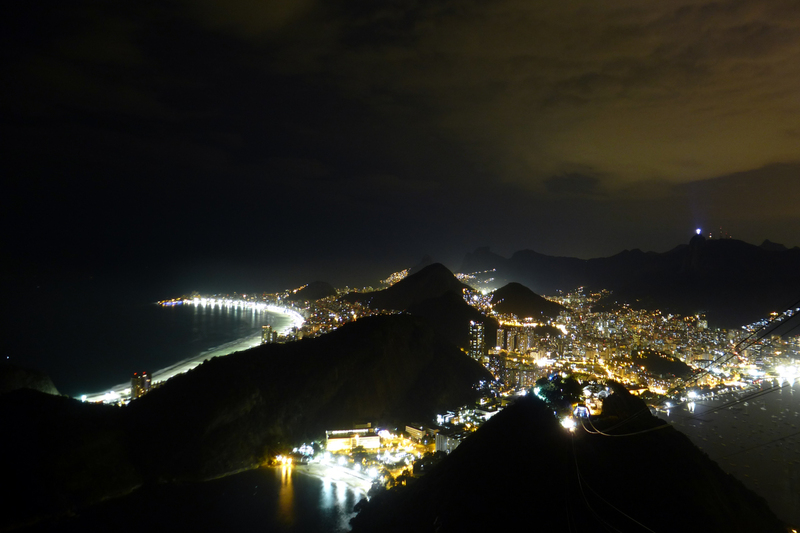 After hopping another night bus to Rio, I met up with an old friend and revisited some haunts in the city, including the iconic Pão de Açúcar (Sugarloaf) mountain. Probably the most topographically diverse city I have ever seen. The camera does not do it justice. 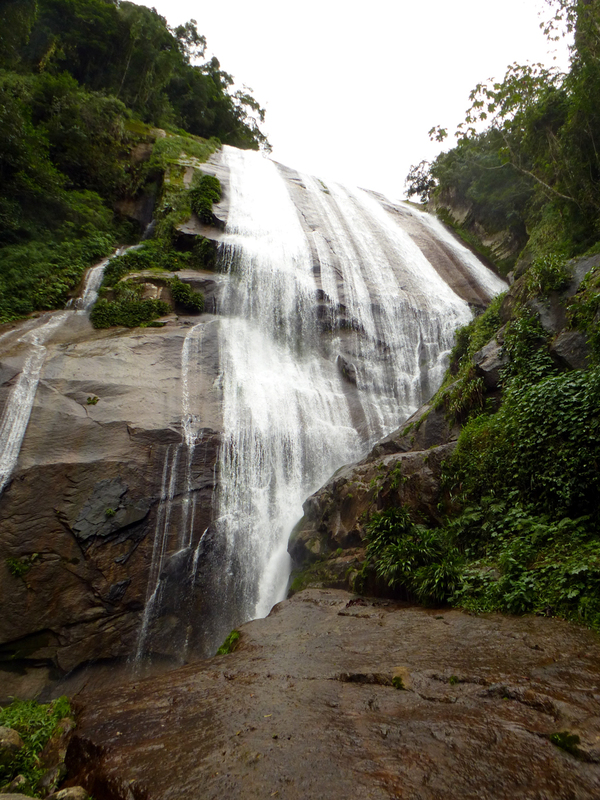 I also explored the Floresta Tijuca, and made some interesting finds, including seeing a rusty-margined guan, pretty waterfalls, a lost iphone, and one amazing moth. I rounded out my journey with another night bus to return to São Paolo and a visit to the Instituto Butantan, a pioneering research center for snakes and snake venom treatment. They also have a collection of native herps and an old school, open air serpentarium, though given that temperatures were in the fifties, the outdoor snakes weren’t in the mood to be very active. 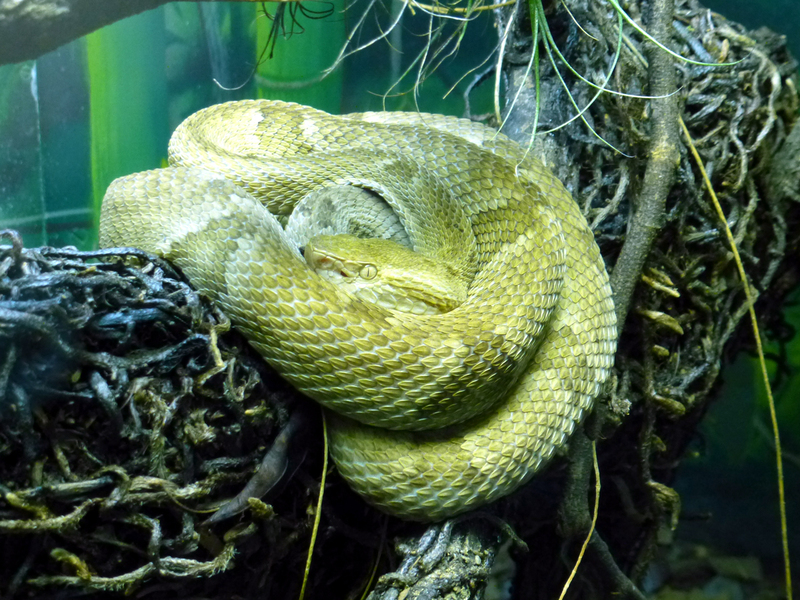 A captive golden lancehead viper (Bothrops insularis), a critically endangered snake endemic to only one island, Ilha da Queimada Grande, off the coast of Brazil. On the whole the trip was a great educational experience, but I was super happy to return to the states and sleep in my own bed! In another week or so, I’ll start thinking about my next conference, the SSAR Herp meeting at the University of Kansas coming up in less than a month! Categories: Articles and Presentations | Tags: brazil, Evolution, Fire ant, Frog, Ilhabela, latitudinal gradient, Lizard, moth | Permalink. 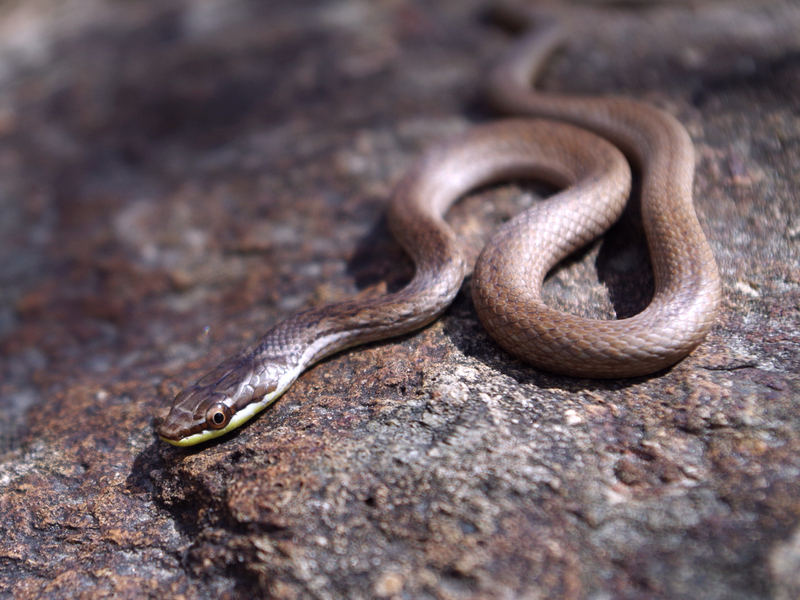 Herping – Guana Island Style! Gail and I recently visited Guana Island in the British Virgin Islands as part of an ongoing research project by the Langkilde Lab to study how invasive Red Imported Fire Ants may be spreading across and affecting the biota of this amazing island (see here for Tracy’s recap of last year’s work). In a few weeks, we’ll post an account of our trip and the research that we did, but for now, I’m just going to throw out the eye-candy…all the cool herps that we got to see and catch! While Guana is a small island (only 850 acres…it’s teeny), it is home to an over-sized diversity of flora and fauna, including herps, and especially lizards (our specialty!). 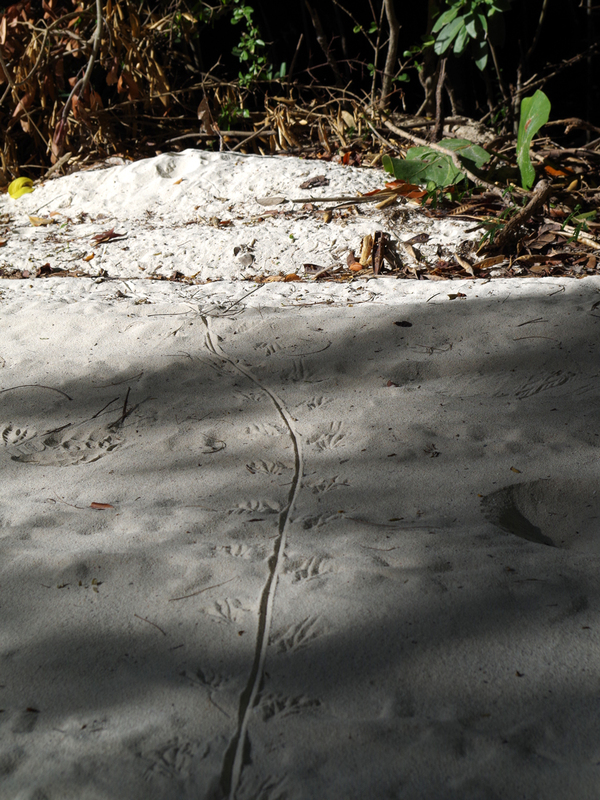 Walking down to our study area on our first morning, we stumbled across this track…lizard or dinosaur? 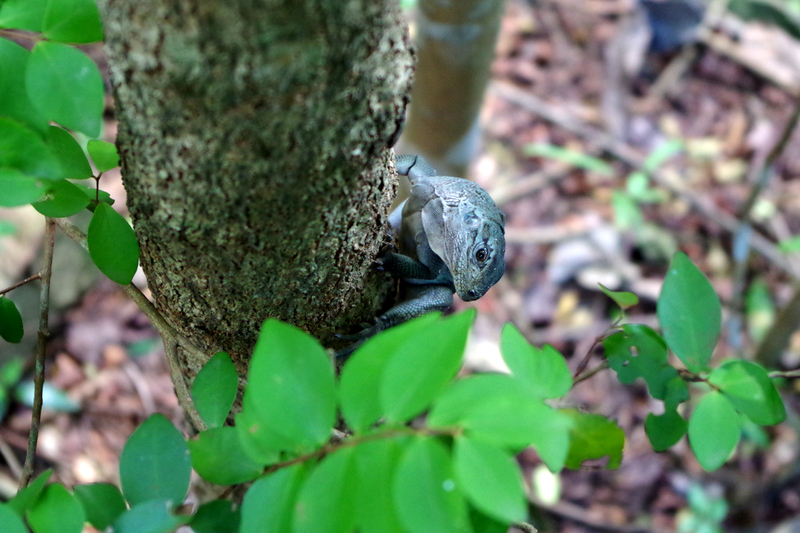 A crested anole (Anolis cristatellus) warily eying me while I was looking for fire ant mounds. These fellas are quite common and easily spotted since they take up prominent positions on tree trunks around the island while defending their territories. This one has a decent sized crest on its tail but some a truly spectacular. A saddled anole (Anolis stratulus) displaying his brightly colored dewlap while posing on a tree limb. 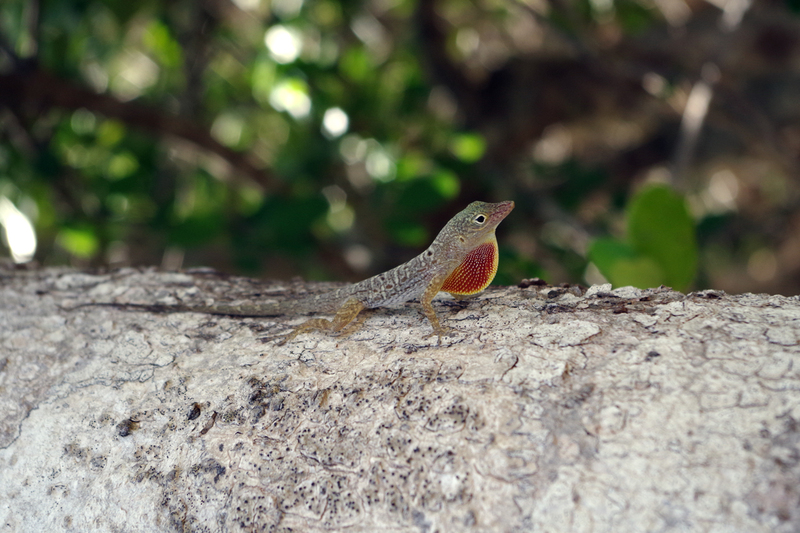 These lizards are often found on trunks on many islands in the Caribbean, but on Guana, because there are few competing species, they can be found on both tree trunks and the ground. 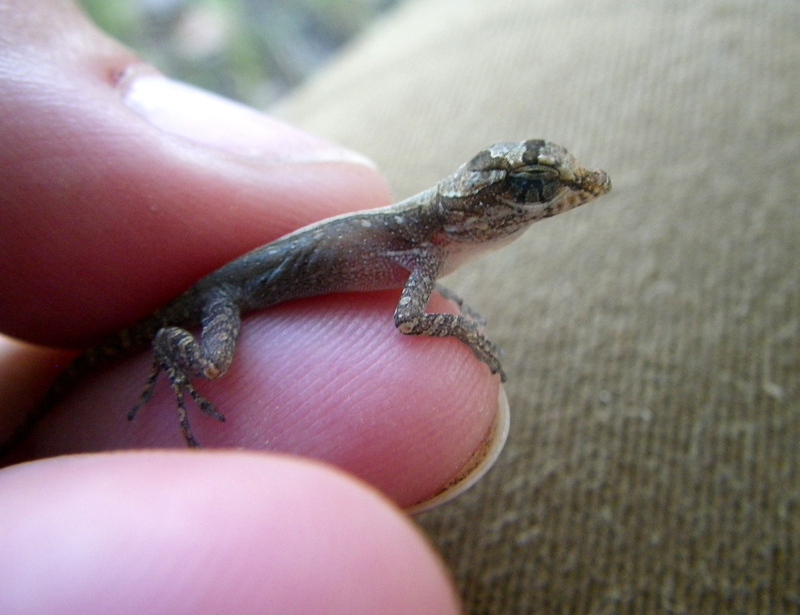 An itsy-bitsy hatchling saddled anole that Gail snagged in our walks over the island. It’s almost transparent! 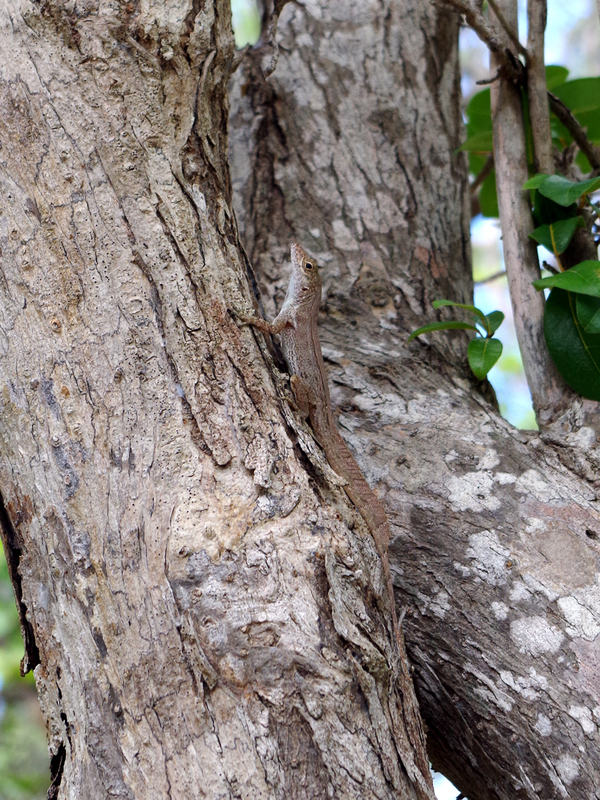 The final anole species, Anolis pulchellus, is a grass anole that inhabits some of the more vegetated parts of the island. I saw three of these, including one sleeping while clinging to a branch, but in each case, I either didn’t have a camera handy or the anole was not willing to sit still to have its portrait made. 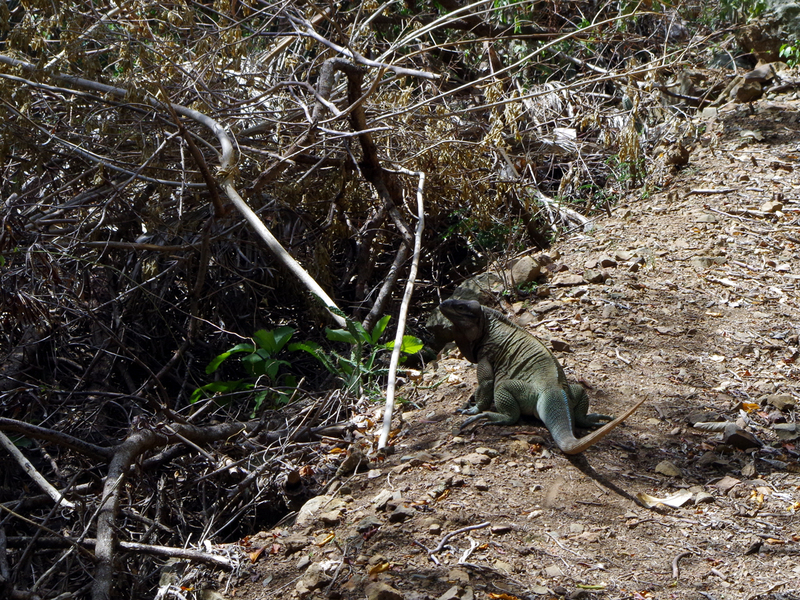 Guana’s most famous lizard is the highly endangered Stout Iguana (Cyclura pinguis). Just 30 years ago, there were fewer than 200 individuals of this species thought to occur in the world, and they were only located in one place: Anegada Island (part of the BVI). As part of Guana restoration efforts, Skip Lazell and the The Conservation Agency worked to restore iguana populations on Guana Island by transplanting some individuals from Anegada. This population is now doing well, with lots of adults and successful yearly reproduction. While we were there, other researchers had caught over 100 hatchlings born this year alone! Large adults are commonly seen on the trails and make quite a racket as they go motoring through the brush. This one paused to express its displeasure with our disruption of its basking by bobbing its head at us. While this iguana breaks 10 lbs, some individuals over 40 lbs occur on Guana! Hatchling stout iguanas were a common site on the island, especially around the orchard where we found this little tyke. The orchard provides lots of tasty fruits that allow hatchling igaunas to more than double their weight in their birth year. This one attempted to make a short dash up a tree away from me, but I got a quick snap of him peeking out from behind some foliage before I left him to his own devices. 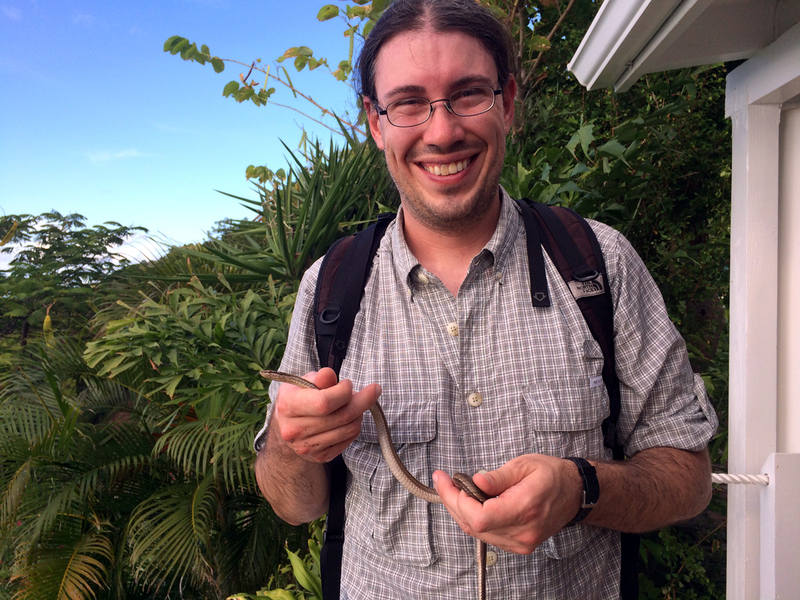 Aside from the lizards, there are also two snake species on Guana. We spotted many individuals of one species, often called the Puerto Rican racer (Alsophis portoricensis) as they are active, diurnal hunters. We saw adults and hatchlings in the undergrowth or zipping across the dirt roads of the island. The racers were easy to catch and surprisingly calm. I never even had one strike at me, though they are apparently slightly venomous if you let them gnaw on you for awhile. The babies were quite cute with a pale yellow chinstripe. Possibly the most dramatic wildlife moment I experienced on the trip involved the predation of a racer on a hatchling stout iguana (though I’ll have to narrate it as I was doing laundry at the time of the observation and, of course, not carrying a camera!). After a walk in search of walking sticks (the insect, not old people kind), I was called over to the main complex building to see a struggle to the death! A very large (pushing one meter in length) racer had snagged a hatchling stout iguana which had wandered into the “living room” of the resort. 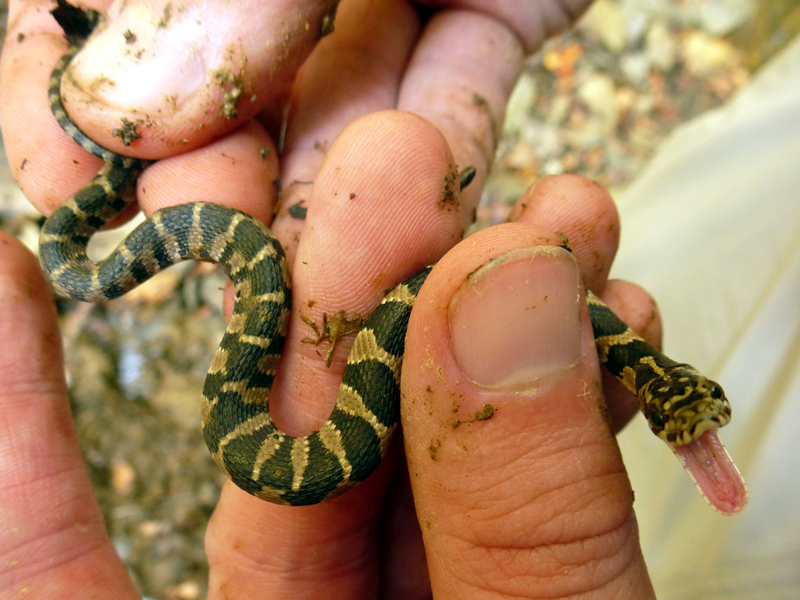 The snake had envenomated the lizard with a bite to the chest and surrounded the hatchling with its coils to hold it while the venom had its way with the lizard’s physiology. Upon seeing us, however, the snake released its potential prey and fled through the far door of the room. After a little while the lizard began slowly staggering around the living room and looked not long for the island, so we moved on to give the snake a second chance at a meal. In the morning, the living room revealed a scene worthy of CSI. A trail of dried blood spiraled across the floor of the living room (presumably from the bite wound on the hatchling’s chest). As the trail approached the exit to the room, it suddenly became a tangled smear with a sizable pile of iguana poop at the end (perhaps a last ditch defensive mechanism?). Apparently this was the scene of the hatchling’s last stand (and the snake’s dinner buffet). While it’s sad to see a hatchling of a critically endangered species (maybe only 500 or so in the world!) meet its end, I found it encouraging to see that the species has recovered on Guana to the point where it is resuming its natural place in the ecosystem. Hatchling iguanas are important food sources for snakes and bird of prey, and, with the extent of reproduction for the stout iguanas on Guana Island, this reintegration of the species into the energy flow of the island is a good sign that the iguana is being reintegrated into its native ecosystem. 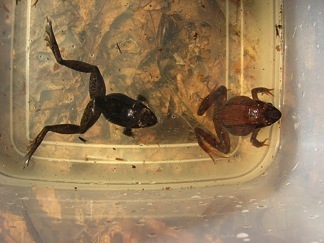 Lest I forget, there’s also one frog species on the island, Eleutherodactylus antillensis. 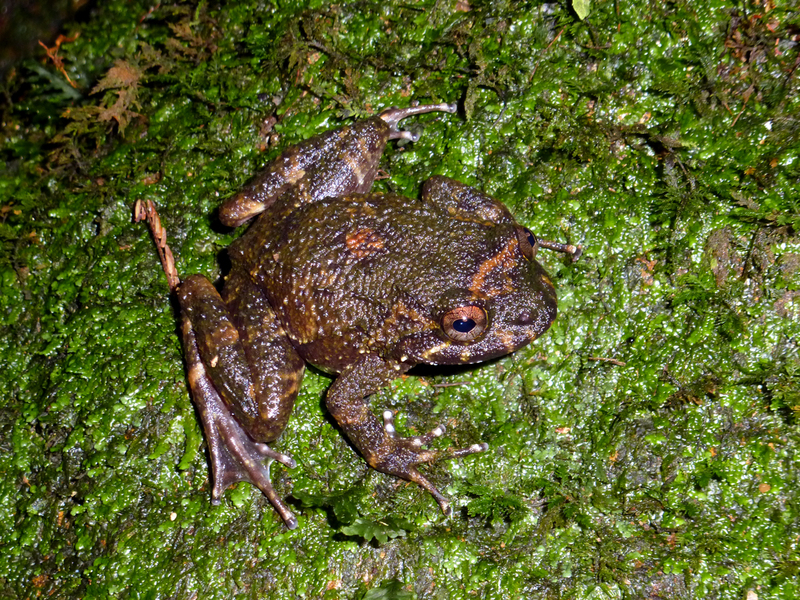 This species is known locally as the Bo-peep Frog, as one of its calls sound a bit like Bo-Peep! As soon as the slightest bit of rain would fall, these frogs would sprout into chorus all over the island, providing a relaxing soundtrack to the lovely tropical evenings. Categories: Fun in the Field | Tags: anole, fire ants, Frog, herps, iguana, reptiles, Stout Iguana | Permalink.